The subject of strawberries and reported bug infestation is undoubtedly the subject of discussion in kosher communities around the world, with some incensed by the notion that rabbis and kashrus agencies are warning that strawberries are indeed considered ‘infected’ and therefore, they may not be eaten without first familiarizing ourselves with the problem followed by the appropriate measures to be taken to make them permissible. 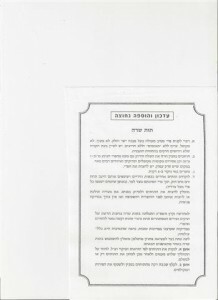 I am providing a translation of the latest instructions released by Rabbi Moshe Vaya Shlita, an internationally recognized expert on insect/bug infestation in foods, an expert who travels the world to meet with experts, consulting with kashrus agencies, and sampling foods in numerous continents and countries. One should try to buy strawberries with a good appearance, firm and fresh in appearance. They should not by pressed or compromised, preferably, not the ‘doubles’, two stuck together, with a smooth outer surface. One should also perform a visual inspection at the time of purchase to ensure the container is not filled with bugs. Using a sharp knife, one should cut off the green tops of the strawberries including about 1 millimeter of the fruit itself. This removes the etched cracked susceptible area. In the event the berry has a pronounced indentation line, one should cut it open. The berries should be soaked in a water solution containing a cleaning agent for 3 minutes. The berries are then taken one at a time and rinsed under a strong running stream of water, turning them constantly while under the water (The water must rinse each strawberry on all sides). It is strongly recommended that one cut open each piece to perform a visual inspection. Alternatively, one may cut them before the soak and rinse, eliminating the need for a visual inspection. Since the summer of 2008, a new infestation was found, bugs that infiltrate the strawberry, making it most difficult to remove them. Inspections in a number of countries have revealed the infestation in worldwide. For the time being, until a solution is found, one should use strawberries as follows. Method 1: Clean the berries as per the above instructions, repeating it three times. Then, one should place the berries in a blender and blend them finely or cook them. Method 2: Peel off a thin layer and then wash the peeled berries again. Rabbi Vaya answers questions from the public daily, from 11:00pm-12:00am at 02-532-5588 and on erev Shabbat from 2:00pm until candle lighting. His wife also responds to questions daily 11:00am-12:00pm. 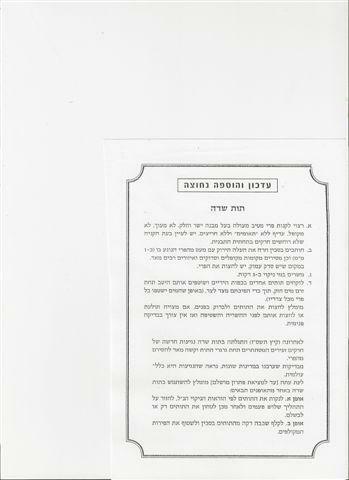 Posted on June 17, 2009 by JKN Israel. This entry was posted in General Interest. Bookmark the permalink. In Suonenjoki, Finland’s number one strawberry production district, voles and moles seem to have destroyed at least a quarter of this summer’s sprouts. In all, there are around 200 strawberry farms in the Suonenjoki region, in Central Finland. According to executive director Ilkka Voutilainen of the Berry Growers’ Association of the Suonenjoki Region, only a couple of farms have been spared from the damage. Suonenjoki farmer Juha Nenonen estimates that on his farm the rate of damage is in the region of 40 per cent. Nearly half of his eight-hectare field has already been ruined by the action of field voles. In addition, the little critters have destroyed the gauze sheeting used to cover the sprouts on a five-hectare area. The ultimate extent of the devastation will be revealed in the coming weeks. Because of the somewhat chilly spring, not all of the flower buds have sprung up yet. Susceptibility of strawberry cultivars to the most common arthropod pests and diseases was evaluated over 1995-1997. High populations of twospotted spider mite were recorded on Elsanta, Kent, Marmolada and Dana, while cultivars Dukat, Kama, Senga Sengana, Syriusz, Real and Honeyoe were less infested. A rapid expansion of strawberry mite has been observed on the plantations. The most affected cultivars were Kama, Syriusz and Gerida. Low numbers of this mite were recorded on Redgauntlet, Dukat, Marmolada and Senga Sengana cvs. The lowest and the highest percentage of flower buds damaged by strawberry blossom weevil were noted on the medium-early ripening ‘Dana’ and early ripening ‘Kama’, respectively. Damages to flower buds due to strawberry blossom weevil were below the economic threshold for all cultivars tested. Mirid bugs damaged mostly the fruits of ‘Kama’, while cvs Cortina, Dana, Elsanta, Gerida, Kent and Senga Sengana suffered the lowest losses due to this pest. The highest level of grey mould fruit infections was observed on cvs Senga Sengana, Syriusz, Marmolada and Dana. Some cultivars, like Kent and Honeyoe, were only slightly affected. Severe leaf spot symptoms were noted on cvs Kama, Kent, Real and Syriusz, while Dukat, Dana, Honeyoe and Marmolada showed high levels of resistance. The cultivars most susceptible to powdery mildew were Gerida, Elsanta and Marmolada. Some cultivars like Cortina, Dana, Kama and Kent were almost resistant. Verticillium wilt severely damaged strawberries of Elsanta, Gerida, Kent and Syriusz cvs while Senga Sengana, Dukat, Kama and Real were resistant. Crown rot (Phytophthora cactorum), a new disease in Poland, has been found only on two cvs, Elsanta and Honeyoe. From this video it is clear that one cannot eat strawberries, no matter how well they have been checked, without also injecting thrips. Thrips are small white bugs that are visible to the eye of a trained observer. The above video shows it all. Dr Levine: Rabbi Vaya has visited Melbourne, and our strawberries are not afflicted in the manner of the ones shown in that video. One should not make blanket statements for the rest of us.